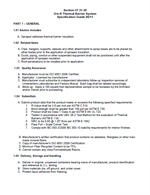 Report of Testing Ure-K Spray Coating for compliance with the applicable requirements of the following criteria: UBC 26-2 Test Method for the Evaluation of Thermal Barriers. Sample Description: Ure-K Spray Coating was sprayed onto a 36" x 36" piece of 1/2" Calcium Silicate Board. 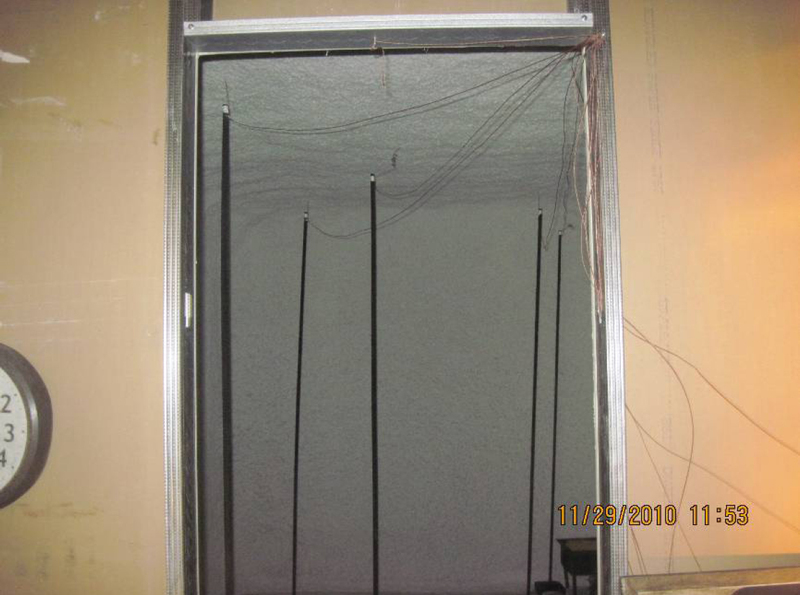 The average thickness of the insulation tested was 1.17", as measured at nine locations prior to the test. 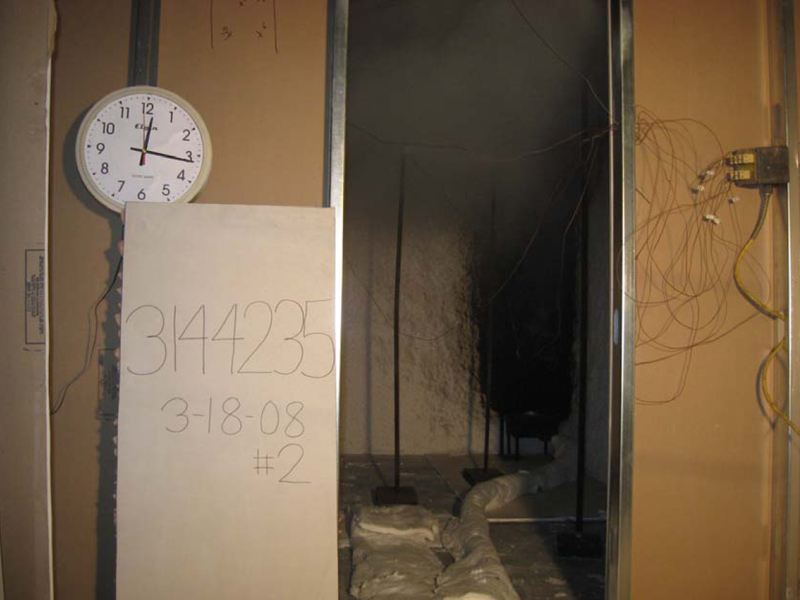 The perimeter of the test specimen was covered with two layers of 5/8" Type X gypsum wallboard, leaving a 30" x 30" section to be explosed to the fire. Test Method: The use of foam plastics in buildings is permitted by most building codes provided the foam is protected by a thermal barrier. A thermal barrier, like Ure-K, will keep the surface of the foam plastics nearest the fire sufficiently low, for a specified time, this will not ignite and cause the rapid spread of fire. This test is to evaluate the thermal transmission performance of Ure-K subjected to fire exposure. 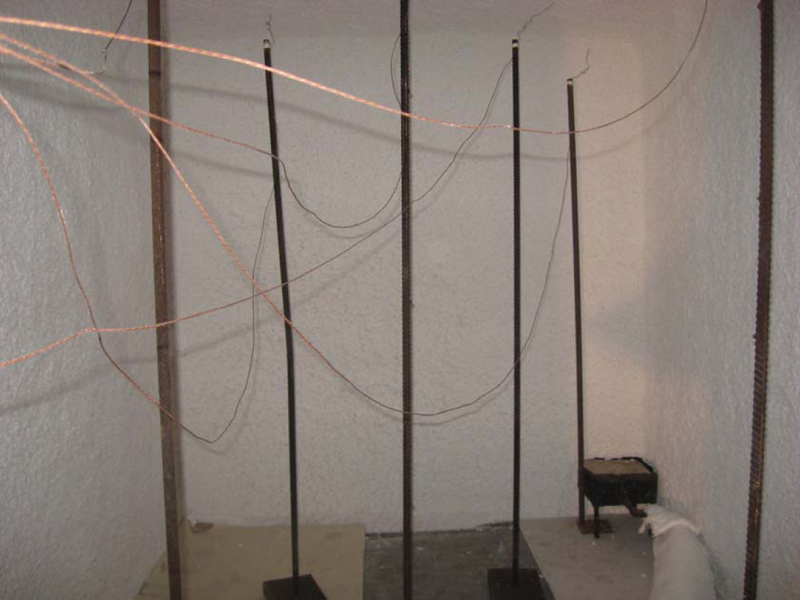 Test Conclusion: Ure-K Spray Coating testing was conducted in accordance with the UBC 26-2 Test Method for the evaluation of thermal barriers. 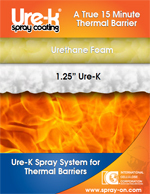 Ure-K achieved a thermal barrier rating of 15 minutes. Sample Description: The test specimen consisted of 1.25 inches of Ure-K as a thermal barrier applied over 8 inches of a 2 pcf spray in Polyurethane foam. The substrate for the system was 7/16 inch OSB. Testing Method: A fifteen minute burn period, with data being recorded every 6 seconds. It starts at 40 kW of heat, and after five minutes increased to 160 kW. This is done to measure certain fire performance characteristics of finish wall and ceiling covering materials in an enclosure under specified fire exposure conditions. It determines the extent to which the finish covering materials may contribute to fire growth in a room and the potential for fire spread beyond the room. This test indicates the maximum extent of fire growth in a room, the rate of heat release, and if they occur, the time flashover and the time to flame extension beyond the doorway following flash over. Test Results: Ure-K displayed low levels of heat release, and low level temperatures. The sample did not exhibit flashover conditions. 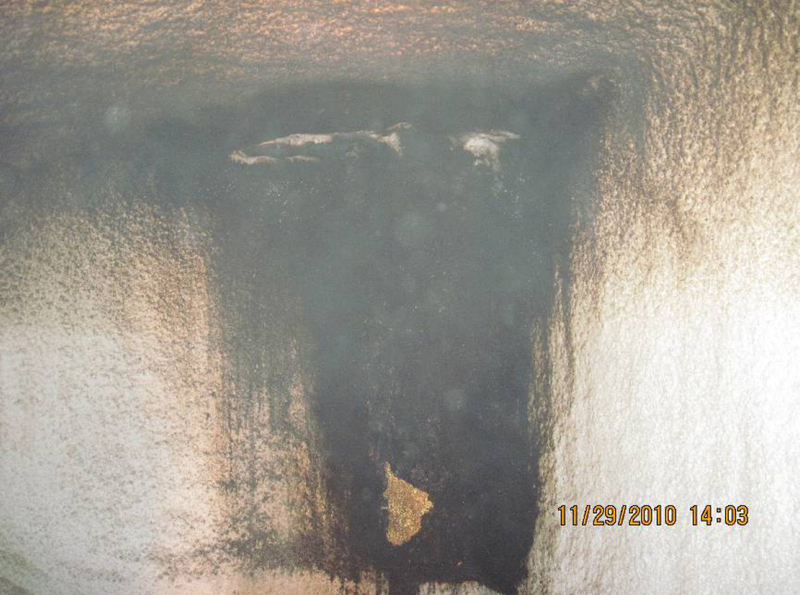 Flames did not spread to the ceiling during the 40 kW exposure, nor did they spread to the extremeties of the right 12-foot wall, or the real 8-foot wall during the test.Ure-K met the criteria set forth in the 2006 IBC Section 803.2.1 / 2009 IBC Section 803.1.2. Sample Description: The test specimen consisted of 1.25 inches of Ure-K as a thermal barrier applied over 2 inches of a 2 pcf spray in Polyurethane foam. The substrate for the system was 7/16 inch OSB. Test Results: Ure-K displayed low levels of heat release, and low level temperatures. The sample did not exhibit flashover conditions. Flames did not spread to the ceiling during the 40 kW exposure, nor did they spread to the extremeties of the right 12-foot wall, or the real 8-foot wall during the test.Ure-K met the criteria set forth in the 2003 IBC Section 803.2.1. Sample Description: The test specimen consisted of 1.25 inches of Ure-K as a thermal barrier applied over 3.5 inches of a 0.5 pcf spray in Polyurethane foam. The substrate for the system was 7/16 inch OSB supported by 2x4 studs and joists, oriented such that the cavities were open toward the "fire side". Testing Method: A fifteen minute burn period, with data being recorded every 6 seconds. It starts at 40 kW of heat, and after five minutes increased to 160 kW. 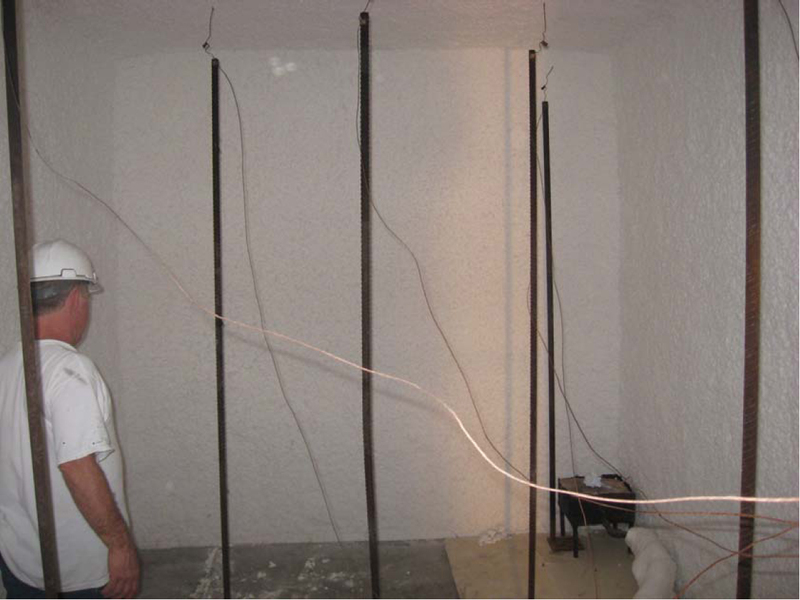 This is done to measure certain fire performance characteristics of finish wall and ceiling covering materials in an enclosure under specified fire conditions. 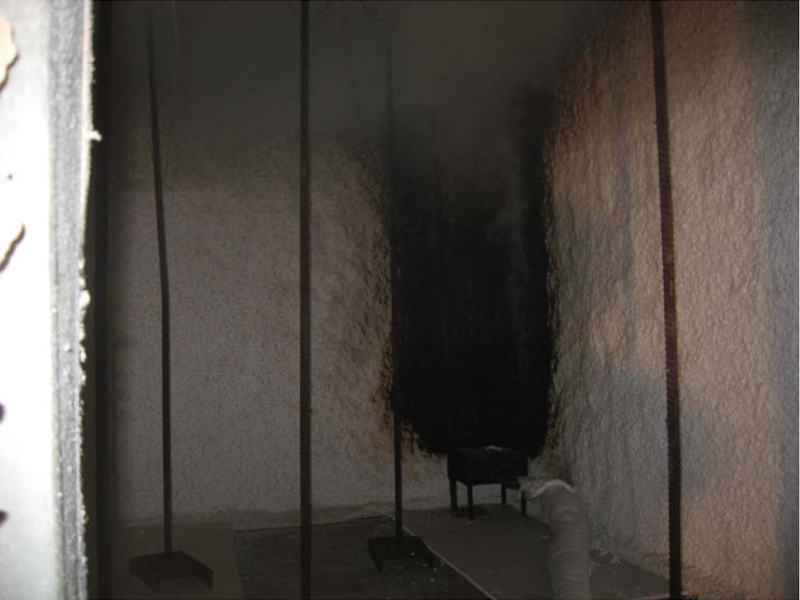 It determines the extent to which the finish covering materials may contribute to fire growth in a room and the potential for fire spread beyond the room under the simulated conditions. This test indicates the maximum extent of fire growth in a room, the rate of heat release, and if they occur, the time flashover and the time to flame extension beyond the doorway following flash over. Test Results: Ure-K displayed low levels of heat release, and low level temperatures. The sample did not exhibit flashover conditions. Flames did not spread to the ceiling during the 40 kW exposure, nor did they spread to the extremeties of the right 12-foot wall, or the real 8-foot wall during the test. 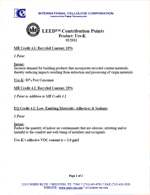 Ure-K met the criteria set forth in the 2003 IBC Section 803.2.1. Ure-K 3.6/Inch 1.25" 1.25" 1.25" 1.25"
Urethane 6.25/Inch 1" 2" 3" 4.5"
Noise Reduction Coefficient: .95 NRC when sprayed 1.25" over open cell foam.